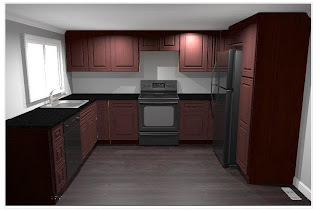 GIY: Goth It Yourself: Kitchen Renovation, Part 2: Let the Planning Begin! Be careful on colour combinations - looking at them on a picture is not the same as being in a room those colours, as I found out at Dad's house. When I was (much) younger, I was asked to pick a colour for the kitchen (a reward for doing more cooking was getting a say in the then-new kitchen). I picked a nice rich green which I thought looked lovely next to the (real!) oak doors of our new cabinets... Well, this was before making fancy CGI kitchens like the ones above was easily done, and all we had were swatches to go on. Dad's kitchen is now a VERY bright green. It actually does not look too bad under natural daylight, and would be better if my Dad wasn't awful at actually completing DIY projects and actually put the tiles up (He starts a million and one projects at once and then is surprised when he doesn't finish all of them.) as there would be a significant wall area covered in neutral tiles (around his sink and window, as a splashback to worktops and hob), but as it is it looks VERY VERY green, and as its a small room and illuminated much of the time with artificial light, it LOOKS very green. We had even previously tried a small swatch of wall to make sure we liked the green. It's just a small patch of green doesn't quite have the same effect as a whole room of GREEN. Talking of tiles, are you planning on having tiles under the sink and behind the hob? Or any kind of splash-back? It really does the wall great favours - paint does not like repeated soaking or splattering with boiling oil. I know that tile-cleaning can be a pain (or rather the grout between the tiles) but it's a lot better than having to de-grease and then strip and then re-paint the wall because the last paint started flaking. 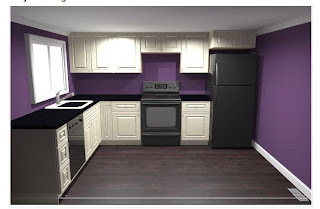 Personally, I can't figure out whether I like the dark stain and off-white walls better or the white-ish cupboards and purple walls better, probably the dark stain version. I will be installing a backsplash/splash-back (funny that we use the same words, but in reverse order :) ), though I haven't decided what kind. One option is to have a matching backsplash installed with my new countertops. I also like some of the glass tile and decorative metal choices. Honestly my advice is to go for the white kitchen, as you can cheaply paint the walls any zany colour you like and with little effort/money you can repaint if you want a change or don't like it. A simple blind would feel much less cluttered than your current curtains. I also think Option B is the best use of space, get rid of that penninsula. It just feels a bit claustrophobic with it in place. You can hardly go wrong with white kitchen cabinets. :) They can be worked into almost any decorating style. Yes, I agree, the peninsula needs to go. The kitchen and dining room are small enough without a chunk of cabinetry taking up space in the middle. I agree -- go with a white cabinets. It will really open up the room. We had dark cabinets for a long time, and just recently changed to white. I am shocked at what a difference it makes. I personally love purple on the walls. But you could do any color. The open layout looks great! I can imagine it will be a lot of work to move the sink and the stove but the result is so nice I think it's worth it. I would have chosen white cabinets for the kitchen but I'm very fond of light colours in interiors (Because of our long dark winter). Good luck with your plans! I like option C with the purple walls. They provide a nice contrast to one another. 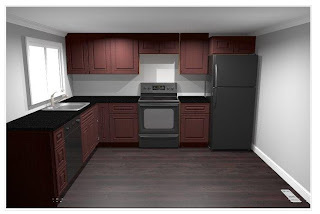 As much as I love dark colors, I don't think dark wood really works in a kitchen unless it is pretty large. Yeah. Though I like dark wood, I'm not sure it would work in my small (and poorly lit) kitchen, particularly if I have a dark floor. It's uncanny how much option B looks like my kitchen. We've started the remodel process as well, though we're not moving any of the appliances. We're just refacing the cabinets (same deal, crap doors but good boxes), replacing the cabinet doors, replacing the counter top, replacing the backsplash, repainting and potentially adding a new stove/microwave combo. Good luck! I'm partial to option b in a dark stain (we're going with "chocolate" which looks so killer). Good luck to you, too! I hope you'll snap some pics of the chocolate cabinets. I like the idea of getting rid of the peninsula, it opens up the space a lot. Also, moving a sink isn't that hard, it's simply buying some pipe, connectors and caulk and connecting it to the already existing pipes. The only difficult part will be the electric. 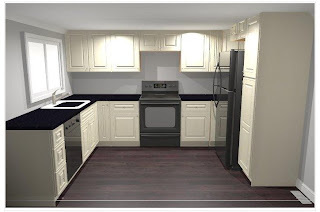 Adding in extra cabinets, such as the pantry is also a great idea, as it always seems that one never has enough space for food, dishes and small appliances, though that may just be me, lol. The electric coming through the floor will make it a lot easier, and probably cheaper if you hire someone to do it. 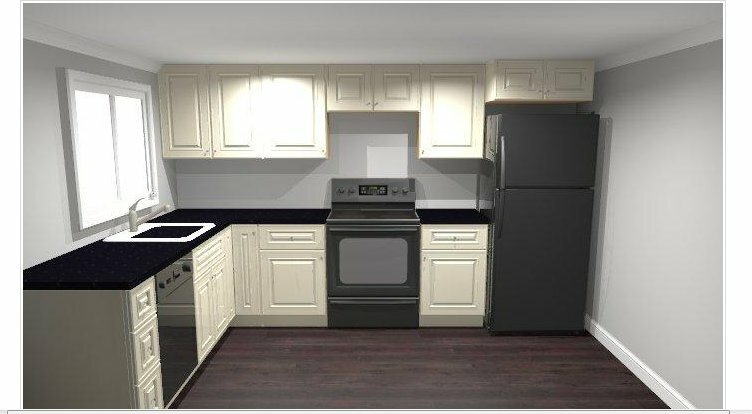 How awesome that you can use the 3-d pics to plan out your kitchen. I think you're smart to go ahead and gut the kitchen. It's a room that you inevitibly spend a lot of time in and it should work for you. Just don't overlook the importance of counter space! Loss of counter space is definitely a drawback of losing the peninsula, especially with option C.
I'm seconding Gothica's comment- I have almost zero counter space. Floor space is lovely, but it's not super useful when you want to start flinging pans around. I vote white cabinets, colorful walls. Yep, even a non-cook like me needs to have a place to set dishes down or assemble a peanut butter and jelly sandwich. I also second Gothica's comment. Counter-space is really, really useful. We've got a tiny kitchen with a flip-down table in our kitchen and really, really feel the lack of counter-space, even with the flip-down table in use. Maybe some kind of folding/sliding/on wheels extra counter-space would be useful? Something you can put away when you don't need to use it, but can bring out when you're doing more expansive cookery projects? Ooh, Option B *does* look just like Captain Morgan's kitchen! Exact same placements of everything! 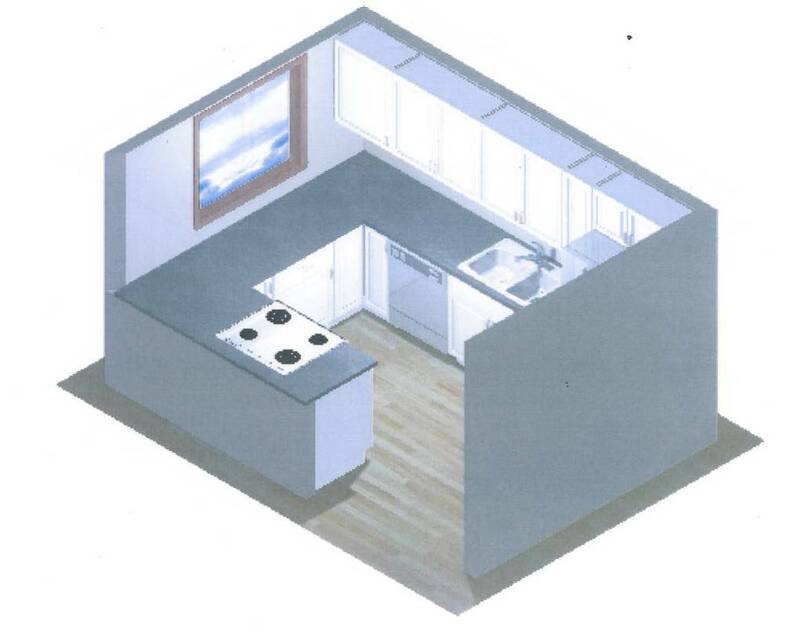 I love that layout, especially if the kitchen is on the small side. 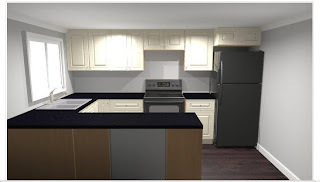 I like the white cabinets - they would indeed brighten up the space. Kitchen twins indeed! :) It's an efficient layout that makes good use of a small space, I think. so many nice options :-D hope you make the right choice for you!